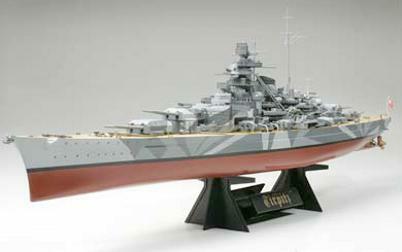 TAMIYA 78015 TIRPITZ GERMAN BATTLE SHIP (1/350)! The elegant lines of the Tirpitz are accurately reproduced and distinguishing features that set her apart from the Bismarck such as quadruple torpedo tubes are also recreated in great detail. The model comes with a specially made display base and a beautiful nameplate for an impressive display.